Roasted peppers, blistered red onions, and grilled halloumi cheese. 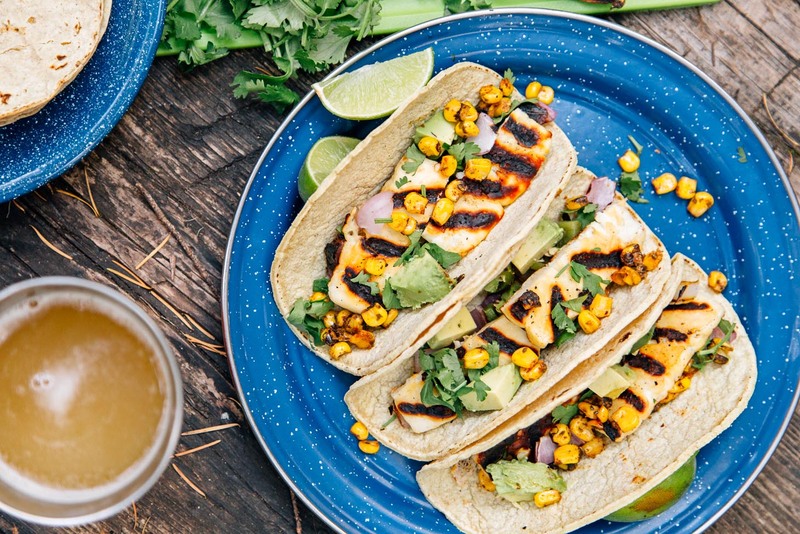 Get the grill fired up and try out these delicious vegetarian tacos the next time you go camping. 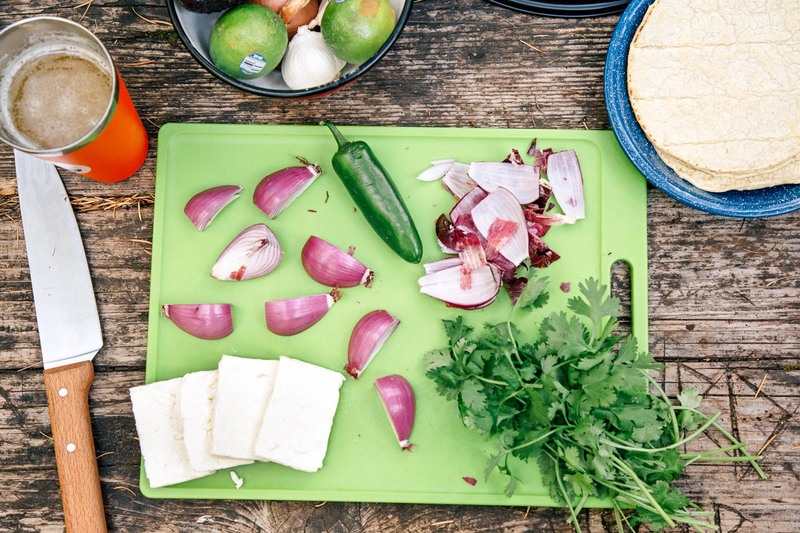 Tacos are one of our favorite go-to meals to make while camping. They’re simple to pack, easy to prepare, and can be made into countless variations – so we never get bored! 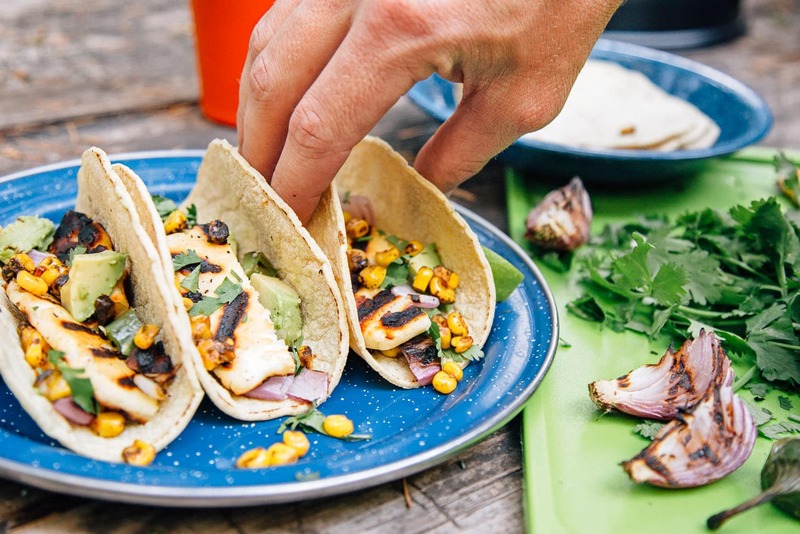 We made these grilled halloumi tacos on a recent trip and they might just be our new summer jam. 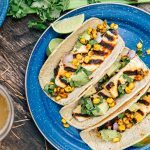 While many taco recipes include some sort of meat, we often like to forgo the hassle of dealing with raw meat when packing for a camping trip. Going vegetarian makes packing the cooler easier and lessens our concern about cross contamination. It also can be a lot cheaper. Now, we loved grilled vegetables as much as anyone else, but for tacos, we want something with a little umami bite to it. One very delicious answer we’ve found is halloumi cheese. If you’re not familiar, halloumi is a firm Greek style cheese that can be grilled without melting due to its extremely low moisture content. We didn’t really believe it until we tried it, but you can get great grill marks on this cheese while picking up some smoky aroma. For these tacos, we grilled up some sliced red onions and a jalapeno until they started to blacken and blister. We then added our halloumi cheese. We then pulled everything off while we warmed up our tortillas. This was a super simple and easy recipe to make. The jalapeno added some serious spice, but you could tone it down by using Anaheim or Poblano peppers or even grill some bell peppers for no added heat. The red onions were a nice touch, but you could also use scallions or shallots as well. But of course, the star of the show was the grilled halloumi. Drizzled with just a little bit of salsa, these were absolutely perfect! 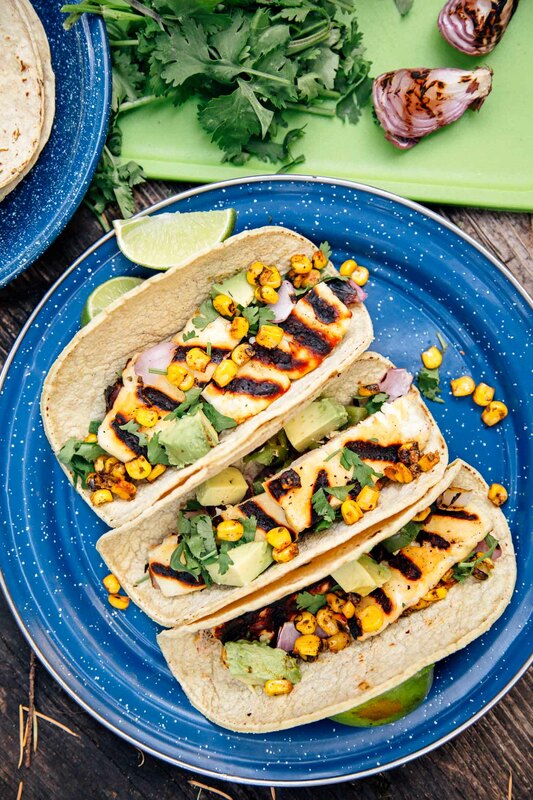 So the next time you go camping and want to freshen up your taco routine, give this vegetarian version a try. ‣ Halloumi is a great vegetarian option for grilling. Because of its extremely low moisture content, the cheese won’t melt, allowing you get perfect grill marks. Grilling the cheese also lets you pick up any of the fire’s smoky flavor. ‣ While halloumi cheese should be kept cool (ex. in a cooler), it’s not nearly as susceptible to cross contamination as if you were keeping meat in your cooler. It’s a great solution for longer trips! ‣ Grillable cheese is just a really cool concept. If you’ve never tried it before, it’s really worth it. ‣ Halloumi cheese can be slightly difficult to track down. We’ve seen it at Whole Foods, but like many of their specialty ingredients, it can be a bit pricey. Trader Joe’s has the best price by far, but they only carry it during the summer months. So get your halloumi fix in now while the getting is good! ‣ Due to its low moisture content, halloumi cheese tends to squeak a little when you bite into it. Do not be alarmed. This is a totally normal. Canadians will be familiar with the concept of “squeaky cheese” as it’s a good sign of authentic Montreal poutine. ‣ There’s a number of other fillings you could pair with the cheese, peppers, and onions in this recipe. We added some corn and salsa verde, but you could also fill them with black beans (this is our favorite black bean recipe) or rice. ‣ For this recipe, we used the Gonzo Grill by Eureka! 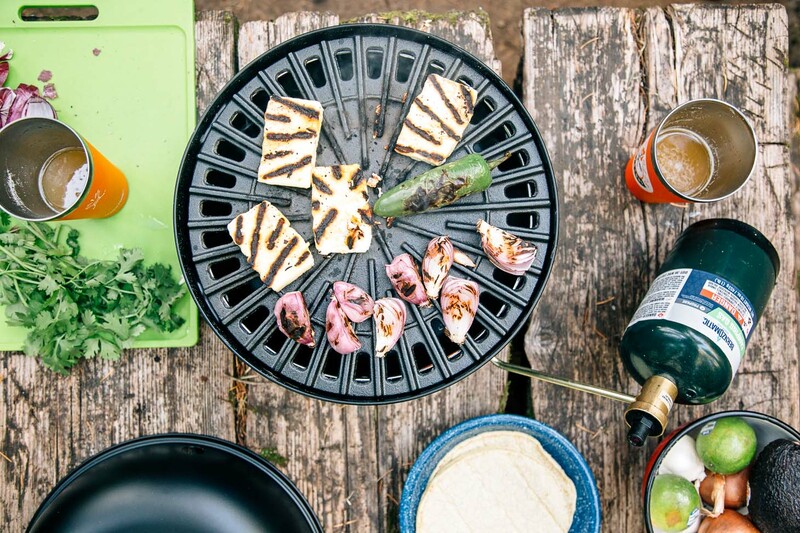 It’s a new propane-powered reversible cast iron grill and griddle combo that we’re testing out. The cast iron grill was great for roasting up veggies, warming tortillas, and grilling our halloumi. Of course, a standard fire pit grill grate would work nicely as well (especially if you want some smokey flavor). But, this meal could easily be made with a cast iron skillet over a standard camp stove too. Place the quartered onions and pepper on the grill. Turn occasionally so they cook evenly. Once the vegetables begin to soften and are black in spots, it's time to add the halloumi. Brush the halloumi with olive oil to prevent sticking. Place the halloumi on the grill and grill each side for about three minutes, or until grill marks form on the cheese. Remove the cheese & vegetables from the grill. Heat the tortillas over the grill, 15-30 seconds on each side. Slice the halloumi into bite-sized pieces. Dice the onion and chop & de-seed the pepper. Build your tacos & enjoy with a cold drink! 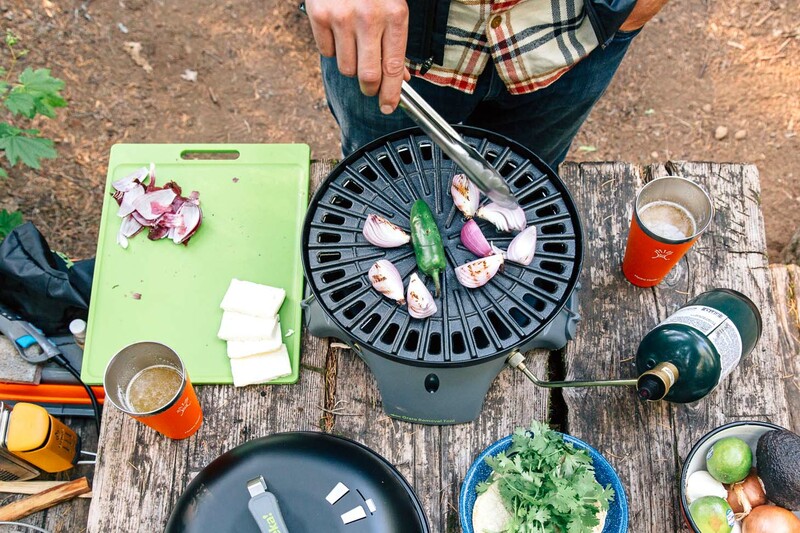 If you don't have a grill, this recipe can easily be adapted for your camp stove. Fry the halloumi in a skillet with a bit of extra olive oil, and roast the peppers and onions on your second burner. I was able to find the cheese in the specialty cheese section at my local King Soopers/Kroger! ??? ?Can’t wait to try these out w my kids tonight!! These look fabulous – those awesome grill marks, and then peppers and onions!? Good enough reason to go camping right there, just to enjoy a meal like this in the great outdoors!